In the year 1997, Sri Ramachandra Institute of Higher Education and Research (Deemed to be University) entered into a historical inter institutional alliance with the Harvard Medical International, Boston, USA. To reminiscence this historical alliance this library was renamed as Sri Ramachandra Central Library. Any member of this University has free access to a rich collection of 54500 books classified under “Dewey Decimal Classification” and more than 700 hard copies of journals and more than 100000 back issues. These “serials” are catalogued in “National Union Catalogue for Scientific Serials” (NUCSSI). For ready reference 6612 copies of Dissertations and 200 Theses are available in physical copies. They have also been uploaded in the “Shodhganga” Reservoir. A book bank functions efficiently as part of the library. 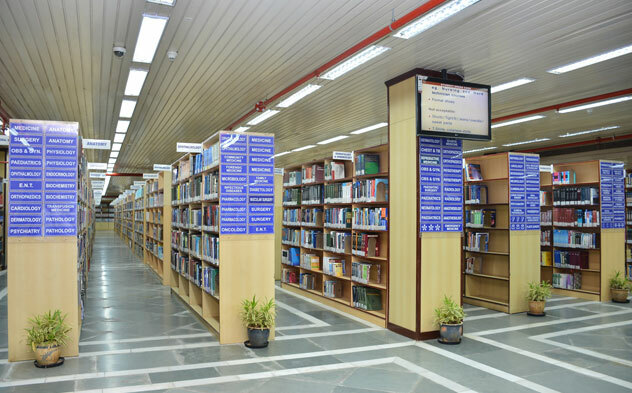 A separate “Archives” section is located, containing old editions of books and back issues of journals which are preserved for ready reference. The oldest medical book available in the library dates back to 1892! A shelf is earmarked for displaying books autographed by the authors is a unique innovation present in our library. A large area is set apart in the library, to enable students to study with their own books. This can seat 252 students, which is in addition to the 270 seats available in the main library. Aware of the need for accessing maximum knowledge in the quickest time by utilizing modern technology, our library provides free access to more than 4500 CD-ROMs, DVDs, and 1500 online journals that can be accessed by ez proxy server in and out of the campus. Our digital library is indeed a show piece. In addition, two Internet labs with over 60 computer systems are available for use by any member of the university free of cost.